San Juan del Rio Catholic Church began as a mission in an old mansion on the river. The diocese had purchased what was known as the Hodges estate in 1958. The property was comprised of more than one hundred acres on the St. John’s River, included was a manor house and Camp St. John. The Switzerland area was beginning to develop quite rapidly and there was a need for a resident priest. Msgr. Joseph Dawson was commissioned to establish a mission there in 1977; the first Mass was celebrated in the mansion on February 6, 1977. Msgr. remained there for 2 years until he was transferred. Father Greg Fay replaced him in 1979. In 1983, the mission was raised to parish status. Msgr. Dawson passed away on January 4, 2002, at the age of 76; may he rest in peace. The old house, which had been built 44 years earlier, had served as a retreat area, summer camp, refugee location center and as a state-run experimental rehabilitation center for teens. The old stead was in dire need of repair if it was to serve adequately as a house of prayer. With much hard work, the old home was transformed into a lovely chapel on the river; 140 people could be seated there. The area continued to flourish and within a few years, the little flock grew from 45 families to over 90. It was time to build a multipurpose church. A site was chosen on State Road 13 so that the new building could be seen from the road. Plans for the new church began to take form. The new building was Spanish in style with a red Spanish roof, coquina walls and vaulted porticoes that surrounded the building. The Dedication Mass was celebrated on September 11, 1988. The parish has come a long way since its early years with over 2,600 households now registered. The current structure has been altered to accommodate the growing number of parishioners attending Mass there. The addition and expansion of a school is addressing the needs of our young parish family by providing quality Catholic Education. The school was dedicated on September 9, 1995. In June of 1999, Father Ed Booth replaced Father Fay as the pastor of San Juan del Rio Church. Father Ed has been a priest for 30 years. He was ordained in March of 1974 at St. Thomas Moore Parish in Pensacola, Florida; the parish in which he had grown up. He presided over our rapidly growing parish and oversaw the construction plans for the very much-needed new “House of God”, which upon completion comfortably seats 1,200 people per mass. There is parking for 375 cars and 12 handicapped spaces. Our new church was completed and dedicated in February 2007. Our not so little family is growing but there is still a warm community feeling present here. One has a sense of belonging and a feeling of being at home. On July 1, 2008 Father John Tetlow became the 4th pastor of San Juan Del Rio. Father John was ordained on May 26, 1984 at The Cathedral of St. Augustine by Bishop John J. Snyder. 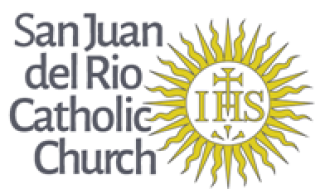 During his first two years as pastor of San Juan Del Rio Father John oversaw the construction and opening of our new state of the art school facility dedicated in 2009. This 16,000 square foot building opened three additional classrooms, a Science Lab, Computer Lab, Art and Music rooms and a Media Center. Father John also managed the renovation of our parish administration building that provides additional meeting facilities as well as a venue for spiritual and social events. Father John will lead us in the coming years as our parish of 2,600+ families continues to grow and thrive for the honor and glory of God.